which will help you enter the realm you are familiar with and use them with satisfaction. is about to be explained. damaged to the manufacturing company. On finding any damage, please inform the shipping company. people’s injury and the damage of machinery. work of the machine not stable. Confirm whether the power is to comply with this machine, because if voltage isn’t suitable, it will damage the components. The workers operating the electrical appliance and machine elements must be trained and then approved. and the maintenance of electrical appliance, but also an experienced professional. To make regular examination and repair and maintenance, eliminate hazards immediately to avoid causing great loss. Don’t maintain machinery when it is electrical. Only cut off the circuit in control cabinet and the power, you can maintain. of examination should be increased. All the components must be maintained by professionals in order to avoid damage and people’s injury. machine, you must check the security device of machinery. Then you can start operating the machine. Don't use electro-welding or flame to cut any parts. If there is a fire, you can use fire extinguisher. Don’t climb the machine. You should use the safe platform or scaffolding. cause mismatch and damage to other parts. matches the one ordered, compare the model and brand. maintenance operations have enough space. You are allowed to carry the machine from the designated place using a forklift. No hoisting. There is enough capacity for machine installation, or at least appropriate measures. 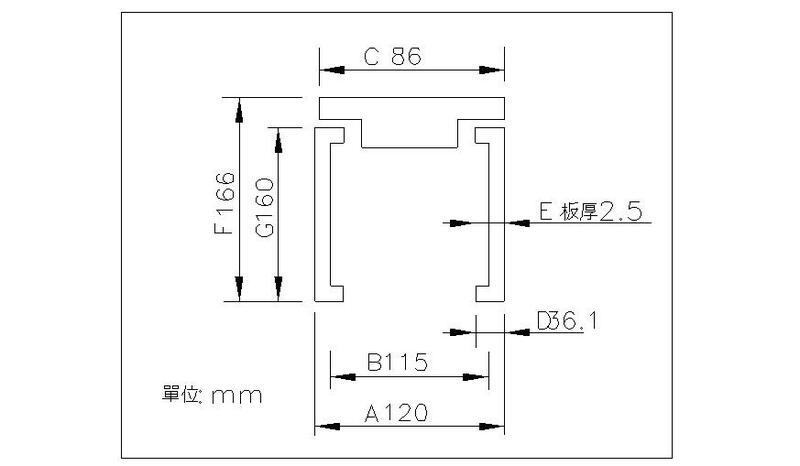 There must be enough supporting points at right position of installation. No pushing and pressing, prizing controlling cabinet. Bottom border is the only part of load-bearing. out after the power connected to machine has been cut. 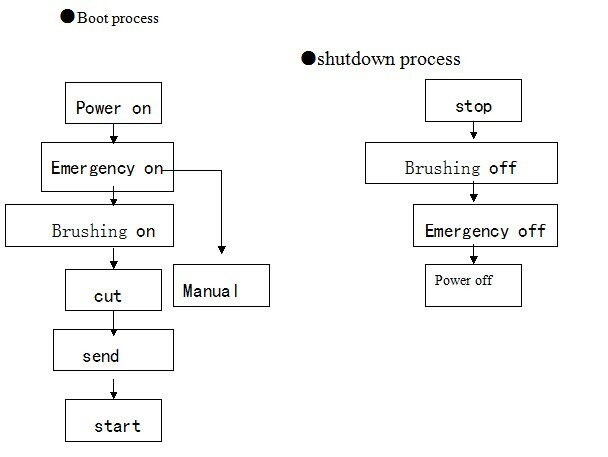 Main power supply can be cut off by cutting the circuit breaker. components may still be charged. cover of junction box and crust. Check whether the bolts are loose before boot-strap. the machine can be operated automatically. correctly and not loose before boot-strap . Otherwise the central guide pin and cutter will be damaged. 3-1-3 to avoid damaging cutter, observe whether the cutter blade is too long when you change it. 3-1-4 don’t put your hands into the working area of cutter as the machine is in standby or running normally. 3-1-5it is invalid to start the command-option if you don’t turn on BOIS. it will be convenient for maintenance .in the future. The circumstance’s humidity is not above 45°C to avoid the failure of some components. air conditioners, for the flowing wind will affect label sleeving. on such components as belt roller, belt, rubber wheel and engine. to cut the shrink film. 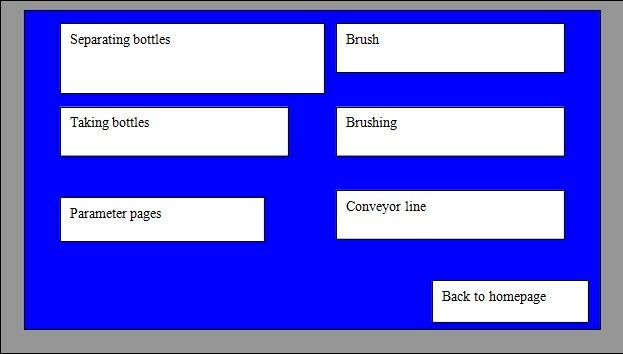 to support mainframe and fix conveyor belt. Use the heat generated by electricity or steam to attach the labels sleeved in bottles to bottles. 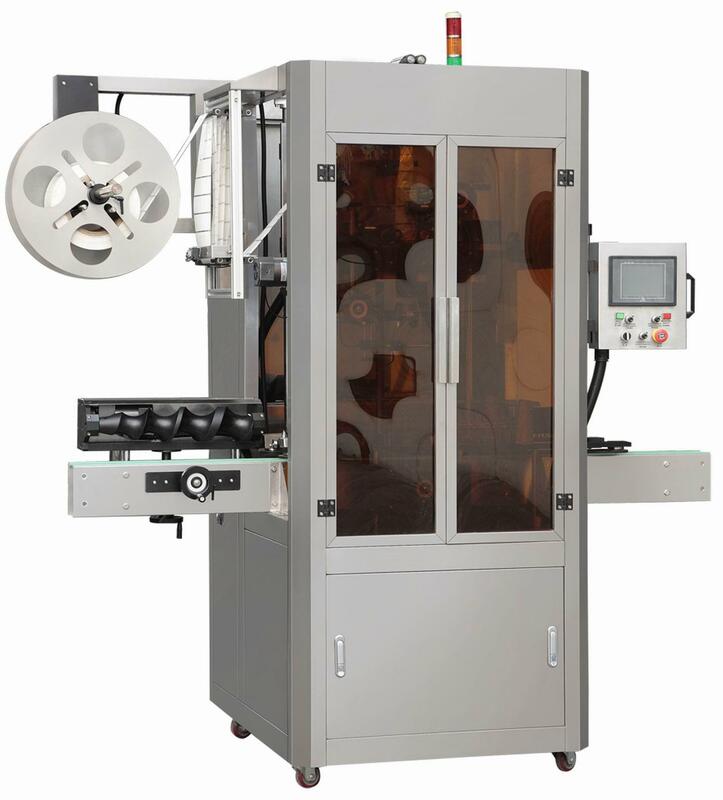 to make shrink film deliver in a fixed size. the label sleeving more easily. of label that will be sleeved. mainframe is not normal, the light is red. It will make the material sleeved and open, making the material convey and cut. it will make the labels sleeve in bottles at a faster speed. slow down the motor to transmit the material. 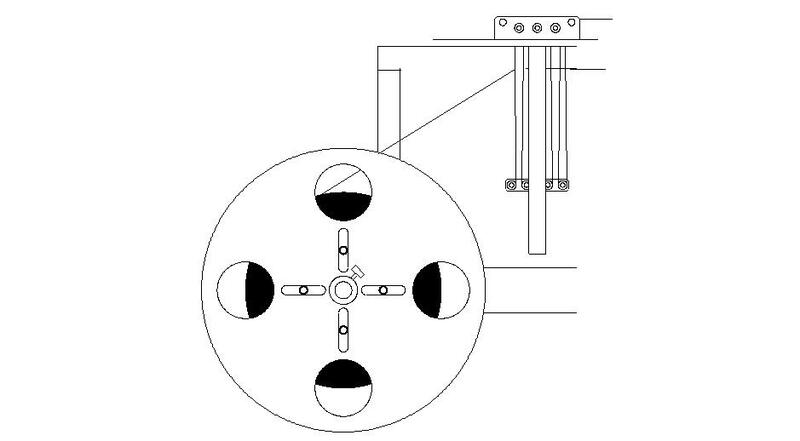 Use transducer to adjust the speed of conveyor belt to match the speed of producing. 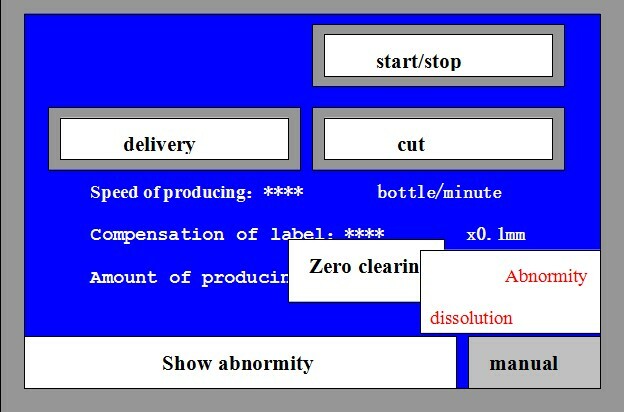 Monitor the suitable bottles position, send signal to make mainframe sleeve volume labels automatically. feeding material plane above electronic eyes plane group. 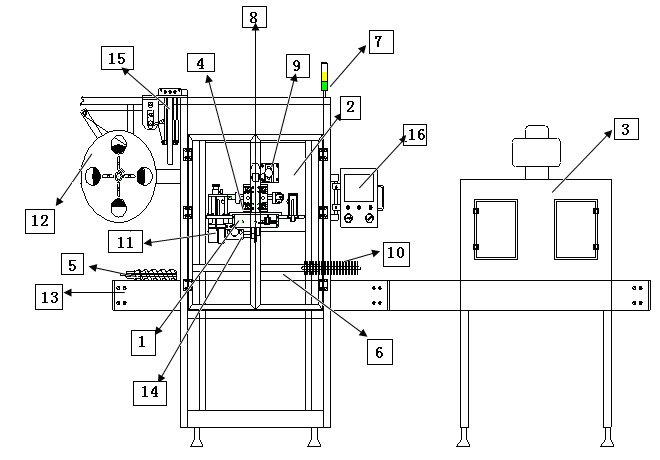 This part is to deliver label coating materials. pressure knobs to operate label-sleeving. plate and press it slightly, then screw the screws. materials pass between the idler wheels. 5-1-3 Wind the material round the wheels, then penetrate materials at the end of the center pole. wheel separate from the main driving wheel. right hand without taking extra trouble. the installation of label is over. labels material. You must press the start button if you want to enter the automatic page. 6-1-1 you can adjust the position of shelf’s slide upward or downward. 6-1-2 if the label above is too long, adjust the slide downward. 6-1-3 if the label beneath is too long, adjust the slide upward until to the right place. the sensitivity of electronic eyes may affect the label sleeving, such as the sensitivity is too high or too low. you should adjust the sensitivity to meet the materials. upward and downward, it means the transparency is weak. of sensitivity on the eyes. When the lights are just off, adjust the machine until the red light is on. the right place on the button of sensitivity on the inductor. sleeved in the bottle. If the eyes are not at the right place, the label won’t be sleeved smoothly. move the eyes from C to B, until the label is in the right place like bottle B . 7-3-1 the electronic eyes are reflection-type. The body is movable, installed on the lead rail. until the reacting light is off. 7-3-3 when there are some things to be sleeved, the light cast receives the reflection of bottle. light cast is too weak to reflect. At this time, you should adjust the sensitivity button until the light is on. 7-3-4 Make trial repeatedly until the sensitivity is suitable. 7-4-1 the speed of conveyor belt .bolts and positioning belt is not the same, causing the label sleeving failure or unstable. 2.the conveyor line is too slow. 8-2-1 if you are to change the blade, dismantle it as being shown. the label can’t be brushed. C If you want to install the blade, you should install it in the direction of installing the cutter head. the label get stuck. Then the machine can run normally. to avoid the plate’s deformation. 8-2-6 if there is any abnormity, strange noise on the blades, please inform us to examine and repair. to understand and with a good affinity. the mainframe to meet the height for sleeving. This control system is a warning message consisting of lights with three colours and showing interface text. when buying this machine. You should practice more time. 11-1-1 grease such sliding surface as the guide rod, lead rail, screw arbor, slide carriage and bearing once two weeks. 11-1-2 Use the machine oil to grease the gear once a week. it at once before greasing. 11-1-5 if you find rust when examining other components at ordinary times, please get the rust off and grease. 11-1-6 please keep the machine clean. Don’t put other irrelevant things on the machine. parts in advance for this matter. the original point of the blade. fixed to avoid the center pole moving. 11-1-14 make sure whether the position and passing material on the material shelf is normal and coating materials are in deformation. 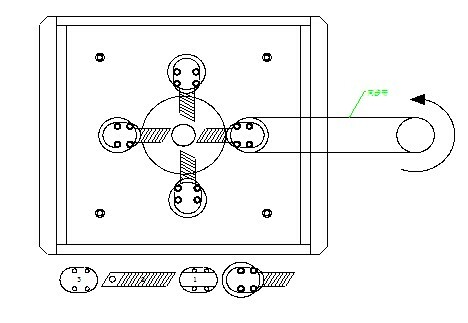 you should the position of material plate. 11-1-17 Make sure the position of positioning belt. The pressure of nipping bottles mustn’t be too tight. 11-1-18 Make sure the revolving belt on the shrink oven. The pressure of clamping bottles mustn’t be too tight. 11-1-20 make sure whether the moving speed after the taking bottle group clamping bottles is at the same speed of the conveyor belt. 11-1-21 make sure whether the electronic eyes are at the right place. Test the sleeving labels before producing. 11-1-22 when the operation is over, turn off the shrink oven first. After the fan cools off ten minutes later, turn off the fan and the power. center pole when the screw arbor connects bottles.